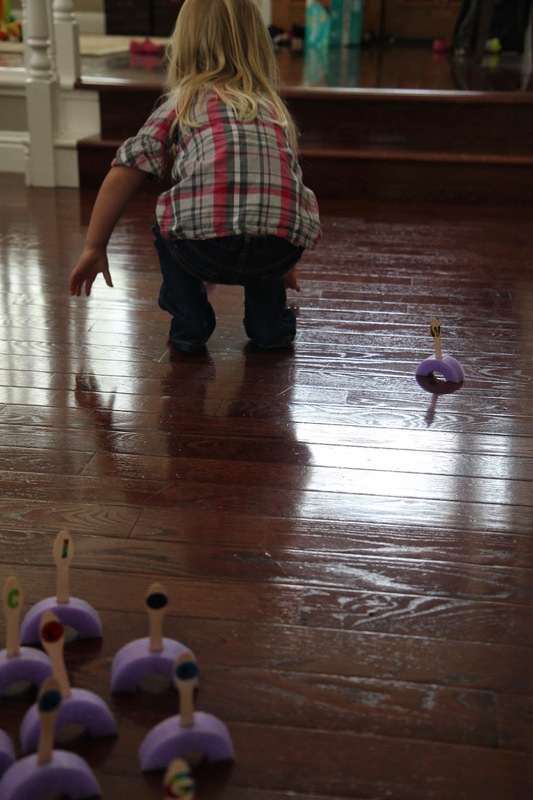 I love when I am inspired by a cool activity to try another fun activity... and create a domino effect of creativity! Earlier this week I discovered Pre-K Pages DIY Traffic Sign post (with free printables) and I saw the signs made of pool noodles and thought, WOW! Those would be so fun to knock down! 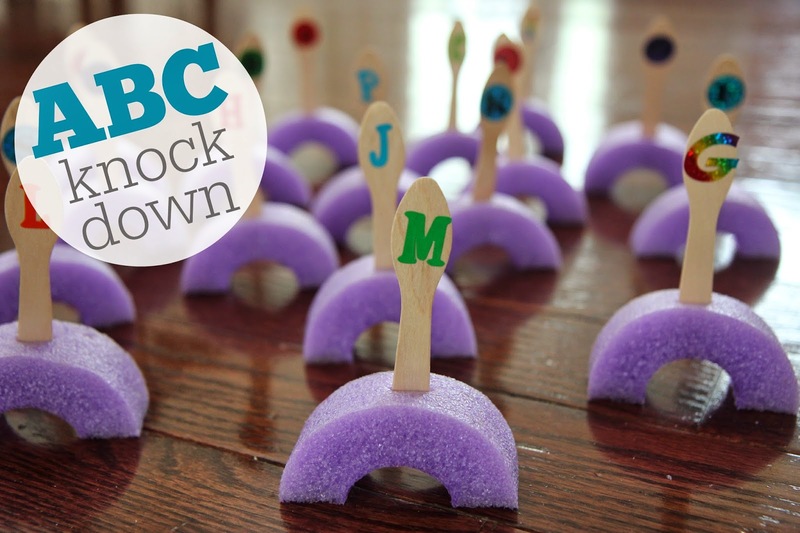 Since my 3-year-old daughter is really enjoying the alphabet right now and also loves to be active and slam or knock things down, we decided to create a simple Alphabet Knock Down game using pool noodles and ice cream sticks. The idea from Pre-K Pages for sticking popsicle sticks through the pool noodle pieces was genius! Before we played the knock down game my daughter helped me put a sticker on each ice cream stick so that we had each letter of the alphabet represented. This was a great way to review the letter names and talk about them. Once all of the sticks were ready we had to prepare the pool noodles!! We sliced pool noodles into small 2 inch pieces and then we cut them in half to make "C" shaped pieces. Then we made a little slit on the top of the arch on each "C" so that we could slip the ice cream spoons in! We pushed the sticks down far enough that they stayed secure while making sure NOT to push them all the way through the pool noodles. As we got started we spread the little alphabet sticks (attached to the pool noodles) around our house so that each one was a foot or two apart from one another. Then we grabbed a ball, picked a stick, said the letter, and knocked the alphabet letter over by throwing the ball at it! At first it was fun to throw our balls as the letters after we tried to identity which letters we saw... but then the game turned into a kick down game! My daughter thought it was hysterical to run around the kick the little signs down... so that's what we did! She would say the letter name, kick it down, run to the next one, and repeat! I kept getting worried that the sticks would go flying, but they didn't. Everything stayed intact. 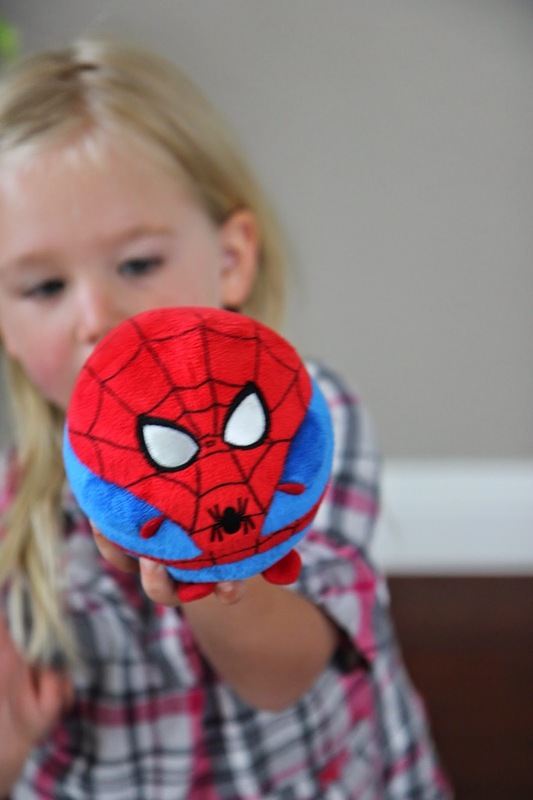 You can easily do this activity with littler kids and just have them knock down the letters... but not worry about actually saying the letter names. When my 18 month old woke up from his nap we set this all up around our downstairs and he had a ball running around kicking them down. He even grabbed another pool noodle (that was still intact) and use it to knock a few down. This was such a fun way to Move & Learn together! You have the best ideas! I just love this! You are so sweet Heidi! Thank you! 3rd attempt to post. Grrrr. Sounds like our 3yo daughters would have a *blast* together! My dd has about 6 mins of "sit still and listen" in her per day. Thank you for sharing such a creative and ACTIVE learning idea!